Korean chicken wings. 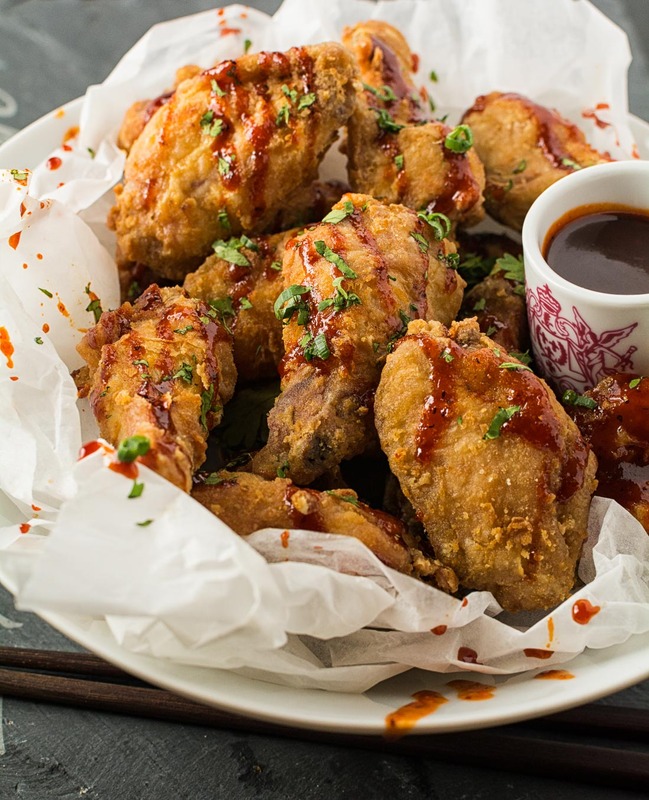 Crispy Korean fried chicken wings with gochujang drizzle. Seriously delicious stuff. For when you want to impress. This is the kind of stuff I dream about. Korean fried chicken wings are so crispy they are loud when you bite into them. Loud. That’s music to my ears. These wings are way better than most restaurants make. This is what would happen if good restaurants served Korean chicken wings. The coating is ultra-crispy. The chicken super tender. The sauce sweet and salty and spicy. I actually surprised myself the first time I made them. I’m going way out there on this one. I know. But they are that good. Crazy good. And the beautiful thing about these Korean fried chicken wings is they are pre-cooked before they ever hit the deep fryer. No worrying that they are done. How? Sous-vide. That’s how. This is one of those annoying blog posts where the author tells you get this piece of equipment if you want to make this. I’m a bit embarrassed to be writing it actually. They have come way down in price. You can get one for around a hundred bucks. And they put you on an even footing with restaurant kitchens. It’s a secret weapon restaurants have been using for years. Now you can have it too. It’s a handy little tool to have around. Sous vide lets you cook perfectly. Every time. You can cook your steaks exactly right. Every time. You can make perfect Korean fried chicken. Every time. Getting it? Restaurants need to get it right every time. Now you can do the same. Every time. That’s the wonderful thing about it. Consistency. The great thing about this recipe is the chicken is cooked before you start deep frying. No worrying about whether the chicken is done here. It’s done when it come out of the sous vide. The frying is all about creating crunch and colour. Three minutes per batch. No waiting. Perfect for parties. And once you get it down it doesn’t just need to Korean chicken wings. You can take these almost anywhere you want. Teriyaki. Sweet Thai red chili. Anything asian inspired with a bit of sugar will work. 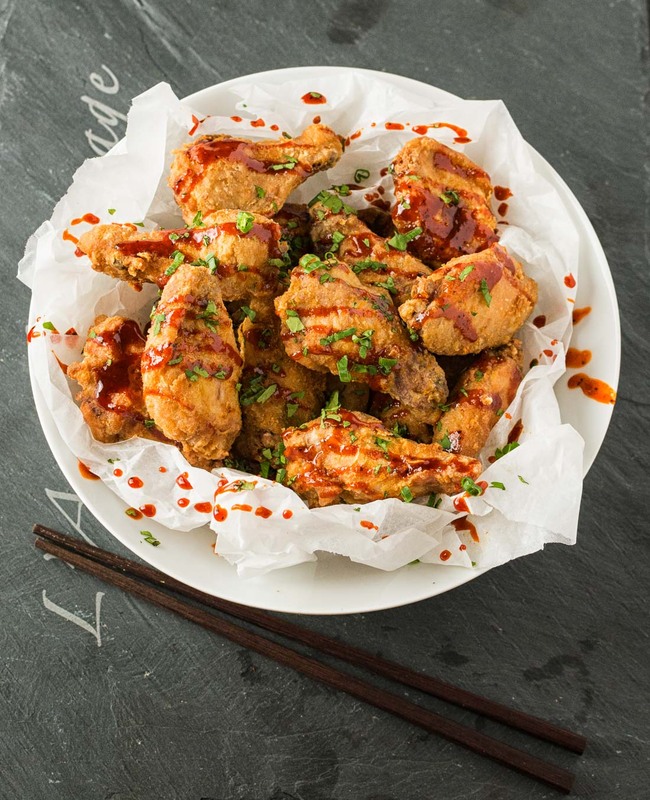 Korean fried chicken wings with gochujang drizzle. Easy. Final cook of 3 minutes. Perfect for parties. Wow your friends. These Korean chicken wings are ultra-crispy, super-tender wings with a spicy Korean dipping sauce. The best thing - they are absolutely foolproof and take only minutes for the final fry before serving. Cook, sous vide, for 2 1/2 hours at 144F. Combine the rice vinegar, mirin, gochujang, soy, sesame oil, black pepper and sugar in a small saucepan. Bring to a gentle simmer, stirring to combine. Let cool. Heat one inch of vegetable oil in a wok or cast iron pan. Alternately prepare your deep fryer. The target temperature is 375F but anywhere between 350F and 400F is OK. The chicken is already cooked. This is all about crisping up the skin. Thoroughly combine the flour, corn starch, salt and baking soda. Remove wings from the vacuum pack and toss with flour mixture. Place coated chicken wings on a wire rack while the oil heats. Fry the chicken wings in batches. If you are brave, just slip the chicken into the oil with your hands. If you aren't brave, use tongs. Tongs are more cumbersome but they works fine. Fry the chicken to colour them. They are already cooked. The frying is all about getting the coating right. That's the beauty of this recipe. It takes about 3 minutes for them to colour up nicely. Remove wings from oil with a slotted spoon. Drizzle with gochujang sauce and serve hot and crispy. In appetizer, korean, poultry. Bookmark the permalink. Joyce – when’s your birthday? I use my sous vide almost as much as my kitchen-aid. It doesn’t stop at chicken wings though. Think perfect fried chicken every time. Perfect steaks. It’s a whole wonderful new world of cooking. I have a sous vide steak post coming up in a few weeks. It works really well. Perfect steaks every time. Confit of duck is another good one. I have a post on sous vide carnitas from a while back. There’s lots you can do with them. 9AM and I’m already drooling over a basket of chicken wings… just Karly things. LOL. Seriously though, these look AHMAZING. Need to try them ASAP! Hi are these spicy? The recipe looks amazing! Thank you! The gochujang used in the sauce is a pretty spicy Korean condiment. If you don’t like spicy, roll it back a bit or try a different sauce. The real gee whiz of this recipe is the sous vide and coating. These look sooo good. I prefer crispier wings with just the right amount of sauce, instead of those super messy ones. I don’t have equipment to sous vide – do you think I can get away with baking the chicken wings ahead of time and then frying to crisp? Wow, these looks pretty amazing! Love the combo of flavors here! Thanks for sharing! The pictures are beautiful! And the korean bbq sauce sounds so good! Thanks very much. That sauce is a good one. You can drizzle it over all sorts of stuff. Sold! Perfect cooking every time? Yes, please! Thanks for the great recommendation on the sous vide and for an excellent recipe. Chicken wings are one of my top favorite foods! Chicken wings are right at the top of my list too. The sous vide technique lets you just focus on getting the coating done just right without having to worry about whether the chicken is cooked through. I love my Anova immersion circulator and it takes up almost no space in the kitchen. Your chicken wings look perfect and the Korean BBQ sauce sounds amazing! Wow, you had me at the title. Then I saw the pictures, and the ingredients…these look amazing! Alyssa, go for it. They are such a handy toy in the kitchen. Not right for everything but when they are right sous-vide is so right. 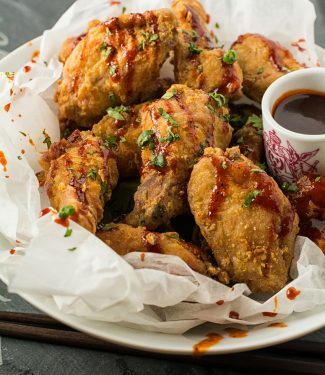 Love love love the idea of a Korean BBQ sauce for even more than just these delicious looking chicken wings! And gochujang is a new ingredient for me . . . It would be good anywhere you would normally use BBQ sauce although you have to use less as it’s spicy. I have a Korean grocery store near me so I’ve never had any trouble finding gochujang. It’s starting to show up in food publications more and more so it’s becoming more common. Alton Brown suggests thay the wings be steamed for ten minutes to get rid of some of the fat. Pat dry and refrigerate on a rack. Then bake or deep fry as usual. 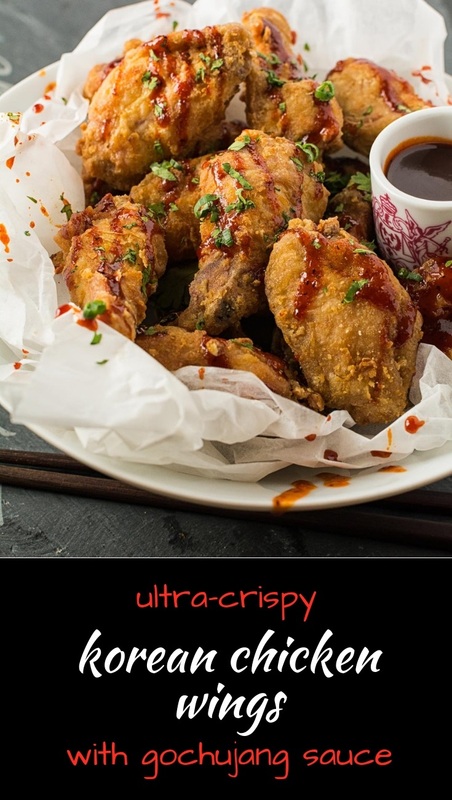 Most Korean wing recipes I’ve seen use cornstarch in the batter – it makes wings crispier..
Jean – If you don’t have a sous vide that sounds like a great way to go. Alton Brown is a smart guy. I imagine the steaming process would not just get rid of some of the fat but also pre-cook the chicken some. Different ways to get to the same place. Thanks for the tip!